Have you ever gone to a FAQ page and it has a bunch of questions that are links at the top of the page. If you click on them they bring you to a section of the same page further down. Sound familiar? 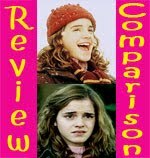 Check out my newly designed Review Index for an example. 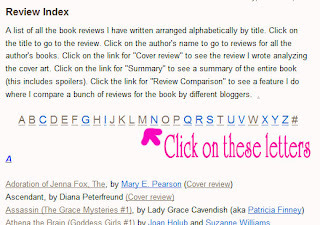 I have the alphabet listed at the top of the page and if you click on one of the letters you will be brought to the section of my review list that begins with that letter. Try it out. See how that works? That’s what you’ll be learning how to do here. The "named attribution" has to do with how you write your code. The "jump" is because you are clicking a link in order to "jump" to another part of the same page. We are going to use the HTML Editor for this exercise. First you need to decide what you want your readers to click on. This is the link you will create (also known as “anchor text”). For a FAQ page, this would be the question. In the example of my Review Index, the links are the letters of the alphabet at the top of my page. Copy and paste that code. The RED letter C is the anchor text. These are the words your readers will see on your page. In my example, I am making a link for my readers to jump to the “C” section of my Review Index and so the text they will click on is the letter C.
The BLUE letter C is the name of the link I am referencing. This is your "named attribution." You can name this anything you want, but I suggest you pick something short and specific. The name won’t affect the code in any way, but making it something relevant will help you remember and later identify your code. In this example, the question readers will see is “What genres will I accept for review?” I have made my link name “genres” because it is both relevant and short. This is the part of the page the link leads to. 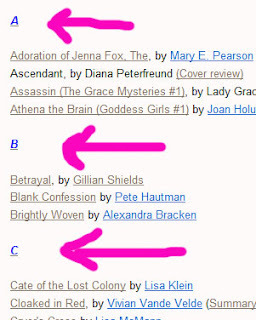 In my Review Index example, when a reader clicks on the letter C in my alphabet list, they will be brought to the section of my Review Index that lists all of the books that begin with the letter C. Notice how each section of my reviews begins with the appropriate letter (each letter is blue and italicized). Those letters are my anchor text for my link destinations. The part in RED is your anchor text. This is what your readers will see and this is what the link will jump to. In my Review Index example this is the blue italicized letters of the alphabet. The part in BLUE is the name attribution. It is VERY IMPORTANT that you use the same name you used in the first code. If you don’t use the same name, then your links will not work. Note that in the first code, you use the pound symbol (#) but in this second code you DO NOT use the pound symbol (#). If you want to make a “To the top” link you do the same thing. You will use the code WITH the pound symbol (#) for the anchor text “To the top” and you will use the code WITHOUT the pound symbol (#) for whatever text you choose to be the link destination. For some reason Blogger always corrupts my code for these jumps every time I edit my post. This is very annoying and I don't know why Blogger does it or how it can be stopped. My work-around is that I have copied my code and save it in a Word document. Then I just repaste it in every time I need to update my post. It's annoying, but it works and requires minimal effort. Click here to make a request for a future How To post. What a great post, as all your html ones are. How did you learn all this? Holy Crow! Yes! You have really, really made me so happy with this post! I had no clue how to do this! Have I told you recently how much I love you for doing these posts? I've been wanting to do this for ages, but all the websites I Google'd made this seem really complicated. I think this will be very helpful and hopefully I can try that this weekend. Thanks for the tips! I love these posts! I've used some of your others too on my blog. They're great. Thanks! Ohhhhhh, this is ahhhhhhhhhsome!!! Where did you get your mad skills, Obi Wan Blognomi? I've been wanting to know how to do this for ages! You continue to amaze me with your knowledge of HTML and more so, your ability to communicate it to others in a simply easy to read fashion! Nice job. I just love these posts. Please keep them coming.! Thank you so much everyone! You’re all so sweet (and adorably funny. Obi Wan Blognomi? I love it!) Thank you so much for the feedback too. It’s great to know that what I’m writing makes sense outside my head! I had been meaning to learn how to do this for a while but then, in typical Small fashion, I procrastinated like crazy. Lucky for me, one of the submitted How To questions was for this topic (so if you have any questions, hint hint nudge nudge, feel free to submit one using the form!) I didn’t know how to do it, so I looked it up and then learned. I’m still not sure why Blogger corrupts the code on edit and how I can make that not happen, so just remember that when you do this! I am still lol'ing at Obi Wan Blognomi. That is hilarious! 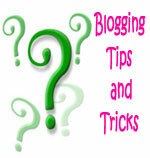 And now I see what blogger does when you edit--so annoying! Laura, Glad it all worked out. If you have any more problems just let me know or email me your code and I’ll see if I can find the problem. Isn’t it irritating!? I don’t know why that happens. It seems to only affect the code with the # symbol though, so at least you only have to fix half your code. You’ll see the corruption on all the codes, but if you leave it on the parts without the # symbol it should still work. I notice blogger keeps corrupting my code too. maybe that is the problem. Oh no :( It looks like it works fine on your site when I try it? Every time you edit the post though Blogger will break it. That's why I copy it and have it saved in a word document. So every time I need to edit I can paste it in instead of retyping everything. Does that help? OMG! I finally got it!!! Stupid blogger. It's so weird and frustrating sometimes. Thanks Smalls! I'm so happy! w00t! I tried it with images and it seemed to work! I can't stop thanking you for the tutorial. It took a few tries because blogger is nuts but when it finally worked, I loved the result. *happy dance* It looks great! You’re so totally welcome! I just found you through a Google search, and THANK YOU. 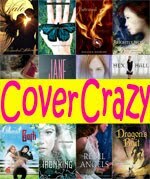 I'm a book blogger too, and not too great with HTML. I was trying to link to a widget on my page. Thanks so much for the help! OMG! I love it! Thanks for the heads up! I just added these for Bloggiesta! Awesomesauce! Fabulous stuff! I've been all over your site all day and I plan on coming back again and again! Thank you for taking the time to do these wonderful tutorials. OKAY. I did it! After several rounds of trial and error, thanks to this tutorial, I now have named attribution jumps. Thank you so much for sharing! Wow! What a great tutorial!